The pound looks set for even choppier times as British MPs will next week get to vote on Theresa May’s much criticized Brexit deal, while there will also be a flurry of UK data for traders to keep up with. The euro will also be in focus as the European Central Bank is due to hold a scheduled policy meeting. The Swiss National Bank will be another central bank deciding on rates next week. In the US, inflation and retail sales figures will be the main releases. 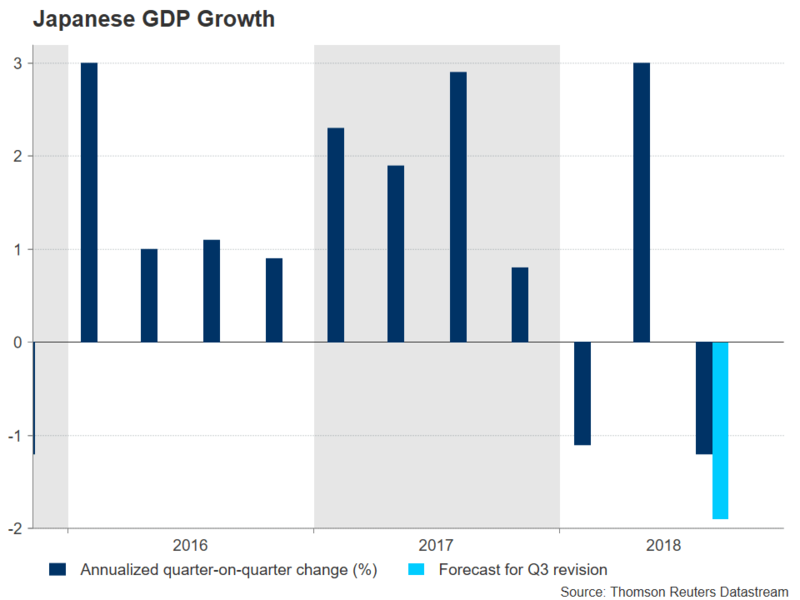 Japan’s economy is predicted to have contracted more than expected in the third quarter, with consensus forecasts for GDP growth of -1.9% annualized rate versus initial estimates of -1.2%. 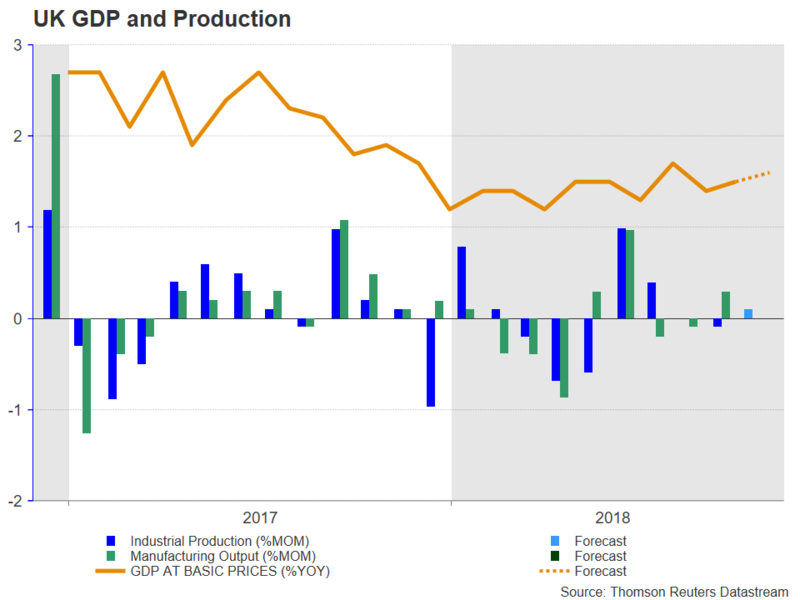 While growth is forecast to bounce back in the final quarter, many analysts are now anticipating a weaker rebound as the outlook for the world economy deteriorates. The GDP revisions are due on Monday and will be followed by November corporate goods prices and October machinery orders on Wednesday. Also on investors’ watchlist will be the Bank of Japan’s quarterly Tankan survey for the fourth quarter on Friday. The outlook survey is seen as a good indicator for business sentiment in Japan across different sectors of the economy, as well as on future spending plans by both small- and large-sized firms. Other data on Friday will include the flash manufacturing PMI for December and revised industrial output estimate for October. A poor set of figures could help alleviate some of the upside pressure on the yen stemming from safe-haven flows generated by this week’s widespread risk averse mood. However, even a positive surprise in the numbers is unlikely to change much the picture for the Bank of Japan, which this week once again pledged to maintain its ultra-loose monetary policy until inflation has reached its 2% target. As investors grow increasingly wary of the shaky trade truce between the US and China, economic indicators out of China next week are not expected to produce anything out of the ordinary. The possible upset though could come from Sunday’s price gauges. Producer prices are forecast to rise by 2.7% year-on-year in November, easing from the prior 3.3%. Softer producer prices are seen as a sign of weakening factory demand for raw materials and a bigger fall could further raise concerns about the strength of the Chinese economy. Consumer prices are also expected to moderate, from 2.5% to 2.4% in November. The remaining data are due on Friday and will consist of fixed-asset investment, industrial output and retail sales. 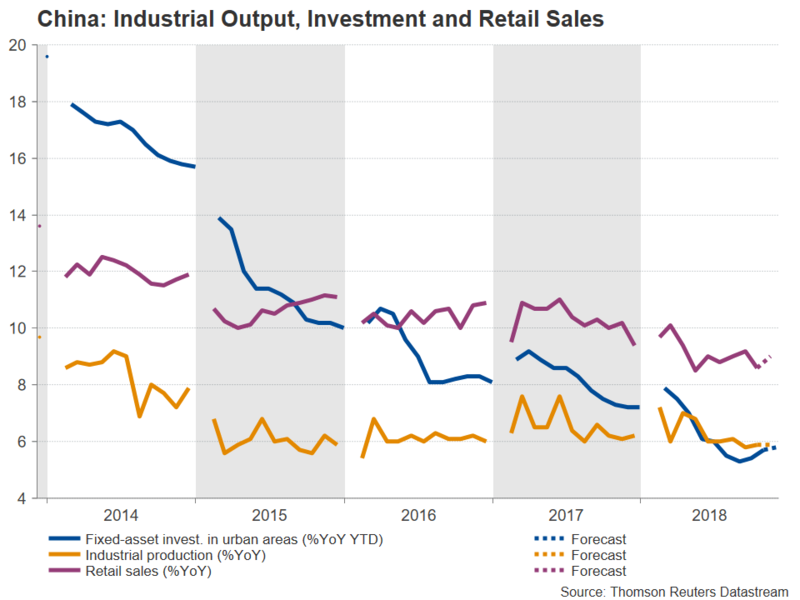 Fixed-asset investment in urban areas is forecast to recover further from August’s record low of 5.3% to 5.8% y/y in the year-to-date to November. Industrial output, meanwhile, is projected to hold steady at 5.9% and retail sales growth to improve to 9%. The highlight on the Eurozone calendar will the ECB’s policy meeting on Thursday, but before then, traders will be able to sift through some economic data out of the bloc. German trade figures are due on Monday and investors will be watching to see if exports posted an increase in October after shrinking in September. The Eurozone sentix index is also out on Monday, and on Tuesday, attention will fall on Germany’s ZEW economic sentiment gauge for December. 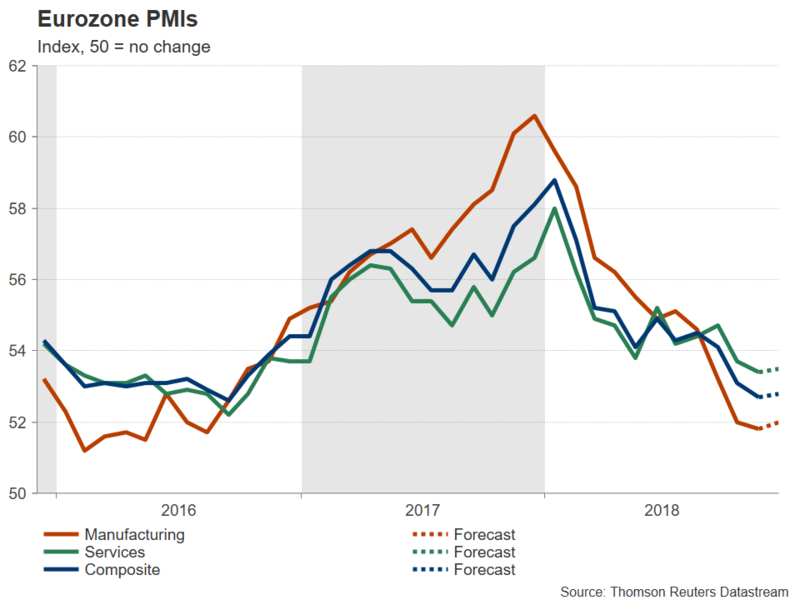 Euro area industrial production numbers for October will follow on Wednesday and finally on Friday, all eyes will be on the IHS Markit flash PMIs for December. The Eurozone’s composite PMI is expected to edge up for the first time in four months in December, to 52.8. However, this would probably not be enough to allay ECB policymakers’ concerns of a prolonged slowdown in the Eurozone. And although Mario Draghi could strike a more cautious tone at his post-meeting press conference on Thursday, he is unlikely to signal any change of path in the ECB’s policy normalization plans just yet. Still, even if the ECB keeps policy and its forward guidance unchanged, the euro is at risk of coming under selling pressure from any dovish remarks by the ECB chief, as well as from downward revisions to the ECB’s quarterly staff projections. Both the Swiss National Bank and the Norges Bank are expected to hold their benchmark rates steady on Thursday. But like the ECB, Switzerland’s and Norway’s central banks could point to increased downside risks and this could weigh on the Swiss franc and the Norwegian krone. For the SNB, the Swissie’s appreciation against the euro during 2018 will be an ongoing concern, while a shock contraction in Swiss GDP in Q3 makes an earlier-than-expected rate increase even less probable. In Norway, the exchange rate is not as much of a problem as the Norwegian krone has depreciated significantly versus the euro over the past month due to the slide in oil prices. But the prospect of weaker oil prices could weigh on the economy, making it harder for the Norges Bank to stay on its current projected rate hike path. UK prime minister, Theresa May, faces a make or break week as all indications are that she is set to lose the vote in Parliament on the Brexit deal she negotiated with the EU. The vote, scheduled for December 11, is now at risk of being delayed and May could use the EU summit on December 13-14 to ask her fellow leaders for more concessions on the Northern Irish backstop issue. British MPs across different parties are united in their opposition to signing up to the backstop arrangement, which could legally tie the UK to the EU’s customs union indefinitely if a solution on maintaining no hard border cannot be agreed on. With the range of scenarios that could play out from next week’s events, including a second referendum and May stepping down, being so wide and numerous, some investors could decide to sit on the sidelines until some of the uncertainty has dissipated. That could partially explain why the pound has been range-bound this week despite the deepening political turmoil in Britain. It could also mean UK data next week struggling to see much market reaction. The UK calendar will get off to a busy start on Monday with monthly GDP and trade numbers, as well as industrial and manufacturing output figures. The UK’s GDP is forecast to have expanded by 0.1% month-on-month in October, pointing to a muted start to the fourth quarter. The other important release to watch on Monday will be the industrial production report. The industrial sector probably eked out growth of 0.1% in October, but output in the manufacturing sub-sector is expected to have been flat. Then on Tuesday, UK jobs stats will be looked at to see if the labour market is continuing to tighten or if the Brexit uncertainty has started to hurt firms’ hiring plans. The unemployment rate is expected to hold at 4.1% for the three months to October, while average weekly earnings are forecast to stay at the three-year high of 3% y/y for the same period. 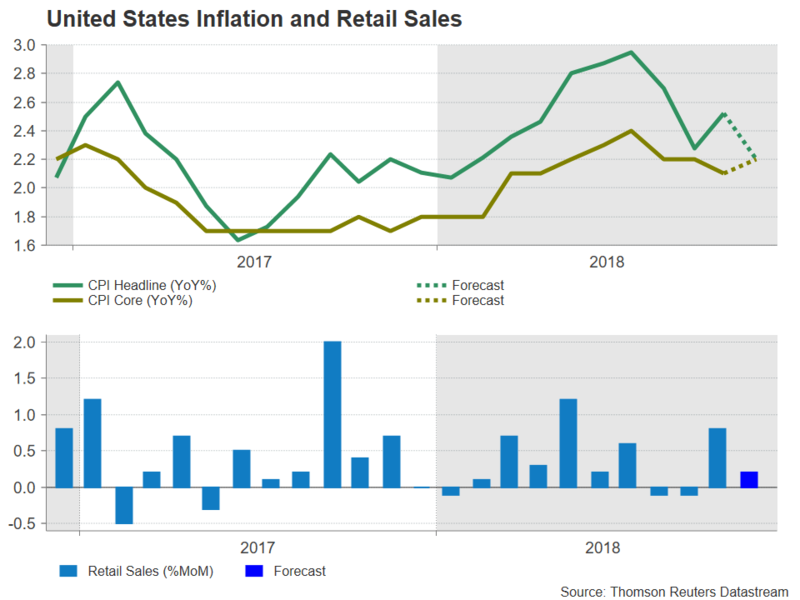 As speculation grows that the Federal Reserve could soon be pressing the pause button on its rate hike cycle, inflation and retail sales numbers out of the United States next week will be monitored closely for clues on the robustness of the US economy. Ahead of those numbers though, are the JOLTS job openings on Monday and producer prices on Tuesday. The CPI report will follow on Wednesday where the headline rate is forecast to ease to 2.2% y/y in November from 2.5% previously, possibly on falling gasoline prices. The core rate, however, is anticipated to inch up to 2.2% y/y from 2.1%. Although underlying inflation is not typically affected by fluctuations in oil prices, at least not in the short term, a prolonged or large drag on consumer prices from lower energy prices could worry the Fed and that in turn would weigh on the US dollar. On Thursday, retail sales figures are expected to show sales rising by 0.2% m/m in November, moderating from the prior 0.8%. Other data to keep an eye on are the November industrial output and IHS Markit’s flash December PMIs on Friday.